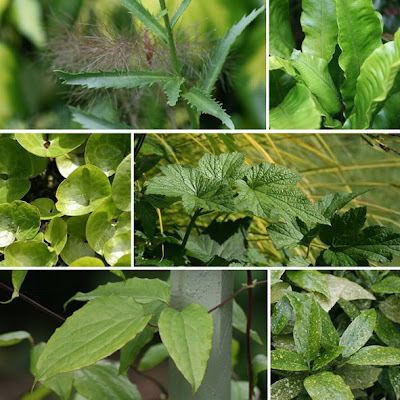 I love foliage plants however this posting has been much trickier than I anticipated. 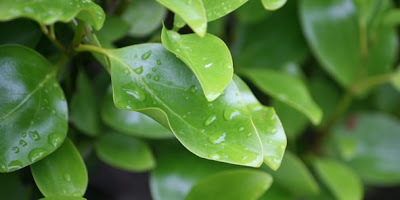 I have more than green foliage plants but when I finally was able to get out with my cameras, between rain and winds, it was clear that there were enough greens to go round for this posting. Perhaps a follow-up posting is now on the cards! Video presentations are great for postings like this and I always enjoy making them. Emma had hinted that one would be nice so that was enough for me! However, I understand that not everyone can view them so I thought I would make up some photo montages too. To see all the postings go to Emma’s original post and if you have posted just leave a comment there too so others can share in your foliages feasts. Griselinia has ended my video and has to be the first photo here too. This is my favourite of all the green foliage plants in my garden and I have had this plant a long time. It came in a pot from my last garden, a severe winter a number of years ago nearly killed it off but after a cruel, very severe pruning back it came. I just love it. Sorting my photos I found myself looking more and more at the different leaf shapes. How varied they really are and I have only a small sample. Starting at top right this first montage has Thalictrum, Sea Holly and Buxus, Euphorbia and Fern, Rosemary, Geum, Hosta and fern. Hellebores start the next montage and although they have wonderful flowers I have always enjoyed their foliage just as much. The same goes for the Wisteria and Choiysa although they both do have such wonderfully scented white flowers. Aegopodum with its variegated leaves is great in the very shady corners of my back garden and is seen with ferns and the Hosta ‘June' which grows a deeper colour there too. The Acers leaves in the final photo don’t really do it justice. Again this is in a shady corner but I didn’t manage to capture the warmth of the green it has. Duck weed in my pond I am guessing is the smallest green leaf in my garden and starts the next montage. Last year I planted Teasel in the hope that I will catch photos and video footage of goldfinches feeding on its seed heads. This year it has grown large leaves although not quite as large as the Gunnera. Sulphur heart Ivy, Chinese Palm with Choiysa Ternata and a ground Ivy that I lifted from under my hedge complete this next set. Bronze Fennel which starts of a darker green and the fine leaf of the Shasta Daisy look good with the background of the Sulphur Heart Ivy. The Hart’s-tongue Fern and round leaves of the Asarum look great in shade. All summer long I love to see the leaves of the Japanese Anemone as they increase in numbers as the clumps mature but in their case I am willing the flowers on for their late display. The clematis leaves also look good but we are usually drawn to their flowers. Finally we come to the Acuba. I have to say I am growing a litle tired of it but as my plant is a good size and stops wind getting around round and under my pergola I guess it will be there for a while yet! Bergenia is on my list for plants I wouldn’t be without. I just love its thick strong leaves. Then there is the very light and delicate leaves of my compact Astilbe ‘Sprite’ tucked amongst the green leaves of my primulas. I have pieces of Bamboo root in a pot and it is growing on happily as well as the main plant in my video. Finally, in this group with more Bergenia growing behind it we have one of many clumps of the smaller Alchemilla conjuncta. I allow this to seed itself a little as it isn’t as rampant as the larger Lady’s Mantle. I love it growing alongside rocks and through the gravel. The Cristata Fern almost completes the selection of green foliage in my garden at the moment. I have still missed a few plants out. There are still more ferns tucked under my Gunnera and in cracks between rocks all around my garden. I couldn’t get near some of them with my camera. Why, oh why, then have I photographed this last leaf of my post? Well, the answer to that one involves two young ladies living in my garden – my daughter’s guinea pigs. They absolutely love dandelion leaves so now they have become the most hunted green leaf of my garden! The video and photos shown above were taken in my garden on June 30th 2008. I think you have the most beautiful green foilage plants Shirl. It makes me want to plant some of them that I don't have. 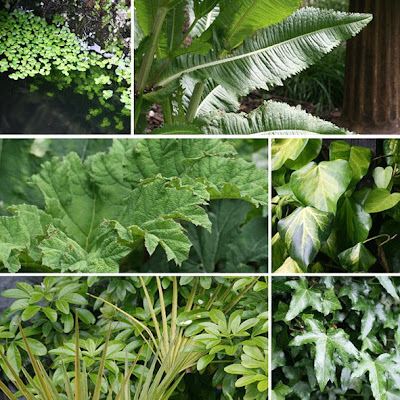 Shirl, What a lovely montage of greenery in video and photos. So many wonderful textures, sizes, shapes, lengths and widths to feast our eyes on... leaves me feeling refreshed. thank you for rounding up participants for this fun project... it was a new way to look at the garden! I am disappointed I missed the fun this time, but am happy to have found out about it in time to hop on over to Emma's and check out all of the gorgeous greens. Your foliage is gorgeous. I love the ferns. They are lush! Great presentation. 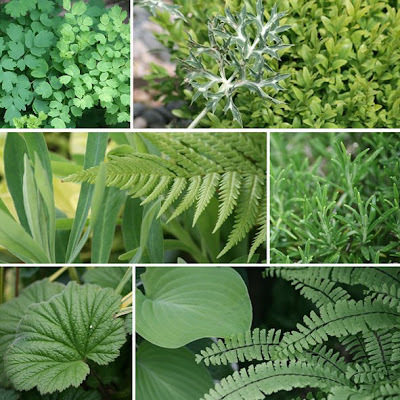 It's very relaxing to see all the greens in your garden. Without all the greens as a backdrop, the flowers would seem "harsh" with their colors and shapes. Just gorgeous! I loved the video and your collection of green foliage is amazing. Very impressive. I just loved it all. Thank you so much for sharing. Your video is a lovely way to showcase the foliage. The wind was doing its best to add movement to your movie. 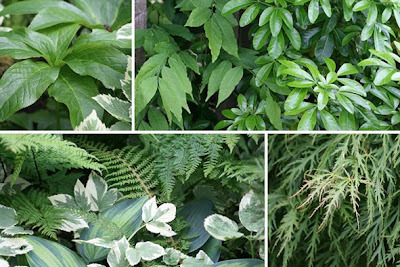 This is a good collection of leaf variations. Lovely Shirl. I've enjoyed doing this meme too and you're right it's made me look so much harder and appreciate leaves. If you need any dandelions, I can send you a bale of them - the public land next door's stuffed with them! 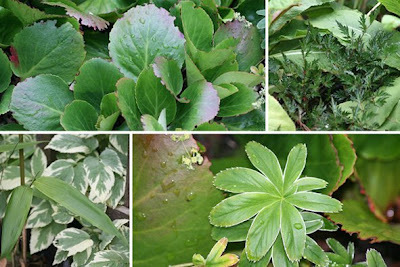 Terrific collection of greens, I love the Asarum, I think I fell in love with that on Tom Stuart-Smith's Chelsea garden; I am going to have to buy me some. This is just lovely...beautiful greenery and technical skills all in one blog! Thanks for encouraging this meme. Shirl, I have no doubt I'd love to get lost in your garden! I love greens and am glad to see someone who loves some of the same ones I do. 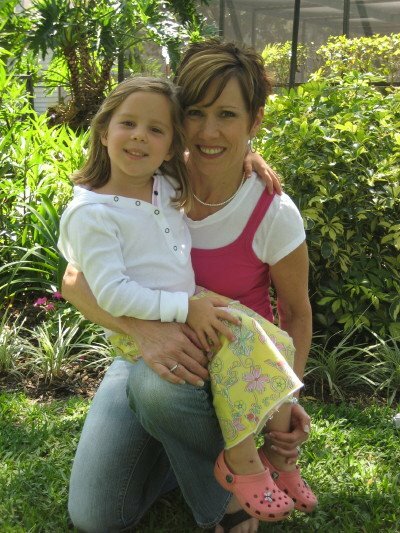 Gorgeous montages, Shirl!